Wiper blades are an essential part of the windscreen washer system. The windscreen washer system consists of a number of coordinated single components which, even under extreme weather conditions, ensure an optimal view. To support the cleaning effect, washer water is sprayed onto the windscreen through nozzles which, depending on the type of windscreen wipers, are either built into the wiper blade or separately installed. Modern vehicles offer an additional headlight washer system. 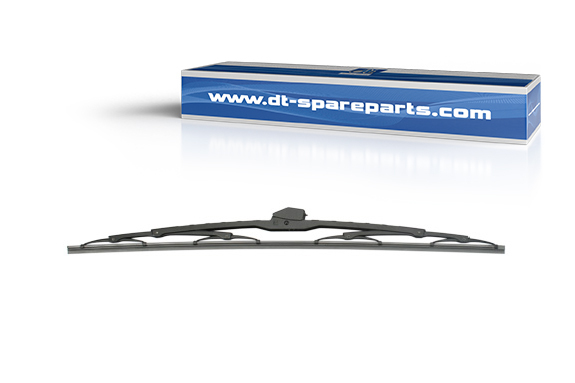 Due to the uniform pressure distribution, DT® Spare Parts brand wiper blades achieve optimal performance under all weather conditions, even on curved screens. The wiper blades are treated with a special surface coating. This prevents the wipers from freezing up and avoids premature wear and noise during the wiping process. For quick and easy mounting on the wiper arm, each wiper blade is equipped with a suitable adapter.